Call it either vintage or retro, the one thing that true style has is that it never goes out of fashion. Vintage couture, costume and textiles are as popular today as they have ever been in an age where everyone is looking to define themselves with a style or fashion past and present. A Hector Powe morning suit, a Christys silk top hat, a Dunn & Co top hat and two cotton shirts (SS1/81). Of Course, the major names will always be sought after: Chanel, Valentino, Dior and Courrages, but with each passing decade more and more labels are becoming collectable: Bruce Oldfield, Alexander McQueen and Vivien Westwood are perhaps the most widely known. Victorian and period clothes and textiles are not just confined to museums, many properties that have been passed down throughout each generation have a trunk tucked away with either a wedding dress, a pair of shoes or dress for a special occasion that has been carefully wrapped. These pieces are sometimes accompanied by original photographs of the wearer and are invaluable for dating and aging of styles and fashions. A vintage green faux snakeskin handbag and similar period handbags, circa 1960s (SS1/14). 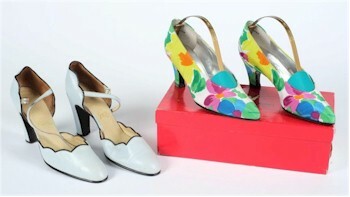 A pair of Charles Jourdan silk court shoes (size 5.5) and a pair of pale blue leather ladies shoes (SS1/24). (SS1/14). As fashion is fickle master and each trend passes to the next, we often discard the old for the new and so many pieces are lost for ever. Discovering a collection of period costume and textiles is always a pleasure as it represent a visible connection to the past.